Enjoy a hearty slice of manual aiming, but remember to save room for new mission rewards. Mass Effect fans finally got their wish. 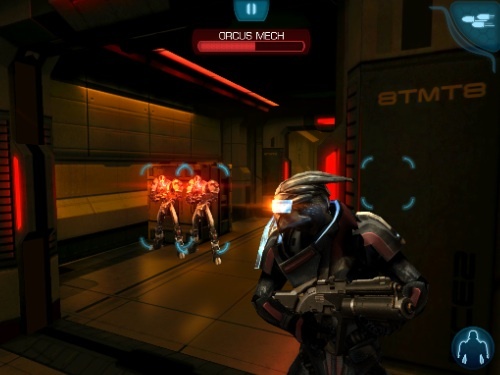 No, not a brand new ending for Mass Effect 3, but manual aiming for Electronic Arts' iPhone and iPad shooter, Mass Effect Infiltrator. That's but one improvement made possible via update. In addition, EA refined the tap-to-aim controls, and added new mission rewards that let gamers earn bonus credits and boost War Assets if they score three stars on every checkpoint. As they say in the sales world, but wait, there's more. New tweaks to Paragon and Renegade mean facial scars and biotic colors change depending on player decisions throughout the adventure, while things run smoother on the new iPad's retina display. The biggest news, though, comes in the form of a bonus mission where users play as a captured Turian. Even better, there may be future missions on the way. What does it all mean? That the thought of spending $6.99 to download Mass Effect Infiltrator just became more appealing.